La Fille du Régiment, Donizetti’s semi-spoken ode to La France about a girl raised by a division of daddies, is at once infamous and beloved for the string of nine high C’s capping act one. For whatever hapless tenor gets assigned the plum role of the opera’s hero, Tonio—and the aria “Ah, mes amis” in which those nine notes are located—it’s the kind of vocal mountain only a troubadour with a blast-furnace for lungs could scale. And yet the payoff is grand: as we learned last night from the Met’s latest revival of Laurent Pelly’s staging, people positively meet their maker over those notes, swooning, howling, applauding for minutes on end—especially when the aria appears as easy and secure as it did for Veracruz-born Javier Camarena last night, especially when the tenor finds it in himself to showboat with a dazzling encore of nine more C’s, as Camarena did. In 2019 the company seems to know intuitively that the production merits a surrounding context shot through with bigger singing and even broader antics, lest people leave once that one encore has ended. And so, this year, they’ve rolled in three divas, an ingenue chirper and two bassoon-voiced dowagers, all of whom more than hold their own against the star tenor. 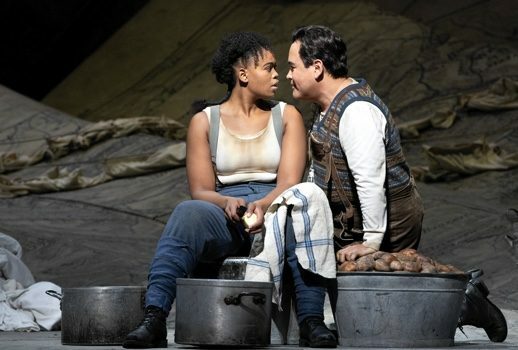 While I’d previously failed to see much appeal in soprano Pretty Yende’s detached approach to coloratura—her stiff, unemotive appearance earlier this season in Bizet’s Les pêcheurs de perles, for instance, made me itch to check my cell for new messages—her performance as the tomboyish Marie, the show’s title character, was an inspired delight, full of energy and pluck, laden with exactly the kind of Gallic punch I imagine the composer envisioning for the role. It turns out Yende is a great match for comedy: one gets the sense watching her inelegantly iron shirts for the canteen or tunelessly practice her scales at the marquise’s castle that this is a vivandière made for the mudslide. Her technique also appears to have been ironed out some since last year; a truly dazzling “Par le rang et par l’opulence,” which filled the hall with gleaming peals of bel canto, left no doubt that Yende has found her voice. 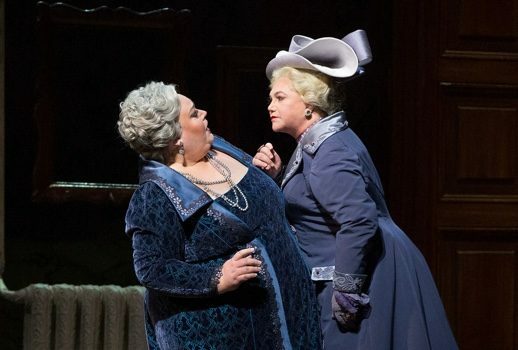 Pelly’s zany way of handling opera—evidenced last year at the Met in his stylized production of Massenet’s Cendrillon—tends to amp up the physical comedy that is French farce’s trademark: lots of knock-knee strutting, pratfalls, and flatulence-level humor. In a sea of drab this February—a “visual gamut from slate to putty,” Zack Woolfe recently lamented about the season’s offerings—this Fille, which Pelly has moved from the Napoleonic Wars to the First World War and which features Chantal Thomas’ cartoonish landscapes constructed cleverly out of giant topographical maps, is a welcome change of mood. Of course, Pelly’s wocka-wocka figurations also prove ideal for a mezzo like Stephanie Blythe, who has, at least since her turn in last year’s Cendrillon, slowly established herself as the company’s comedian in chief. I swear to god, I yuk every time that woman takes the stage. And then we had our big Act Two cameo, the Duchess of Krakenthorp, here in the form of basso Kathleen Turner. The gags here were obvious, with Turner mooing and Bea Arthur-ing her way through AP French. Still, I wish Pelly had made even more of this part—so much humor one can crank out of Krakenthorp!—especially since Turner is herself such an adept jokester. On the other hand, I suppose when a Duchess’ range drops lower than an army captain’s, things can get confusing for an orphan. Especially for one who, like Marie, has enough papas as it is.